As we’re approaching the business end of the season, a single match can often have a huge impact on the fortunes of the teams involved. I’ve used the ratings model to identify this weekend’s most pivotal fixtures by simulating the rest of the season and seeing whose fate changes the most when their match ends in a home win, a draw or an away win. Below I’ve picked out the five matches where the most appears to be at stake for both teams, assuming the rest of the season plays out as the model expects. The actual numbers we’ll see after the weekend won’t be exactly the same as the ones shown here as some of the other fixtures being played this weekend won’t go the way the model predicts. Therefore you can think of these as the model’s best estimate of each match’s impact. Yeovil’s trip to MK Dons this weekend could prove pivotal. 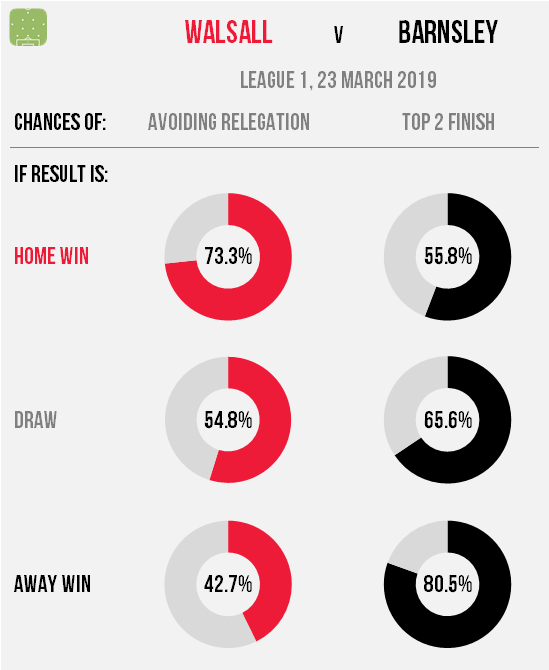 The hosts’ chances of automatic promotion are fading, but a win here – which would surely have been the target regardless – would nudge them close to 50:50 while defeat could slash them to one in four. For the Glovers, defeat could see 23rd-placed Macclesfield draw level with them on points and leave them likelier than not to go down, although their goal difference would probably keep them out of the bottom two for the time being. Yeovil aren’t the only relegation-threatened side taking on a promotion hopeful in the fourth tier. 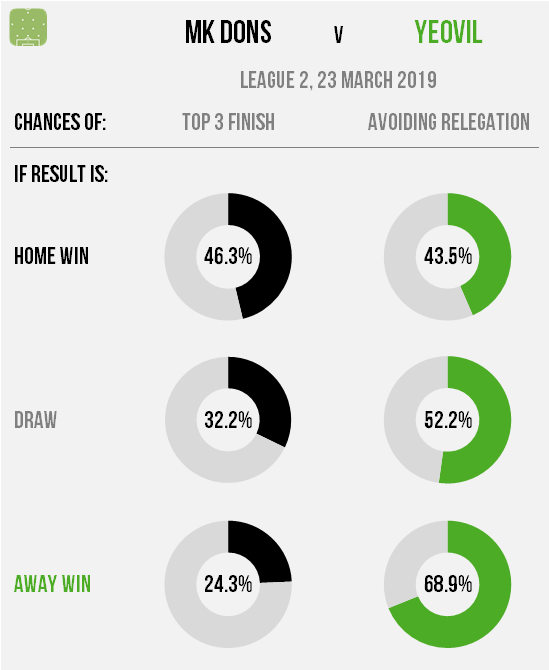 The Magpies are running out of chances to drag themselves out of the relegation mire and it’s gotten to the point where even a home win here would only boost their survival prospects to around one in four. However with defeat whittling them down to worse than one in 12 they’ll have to play for a win here. 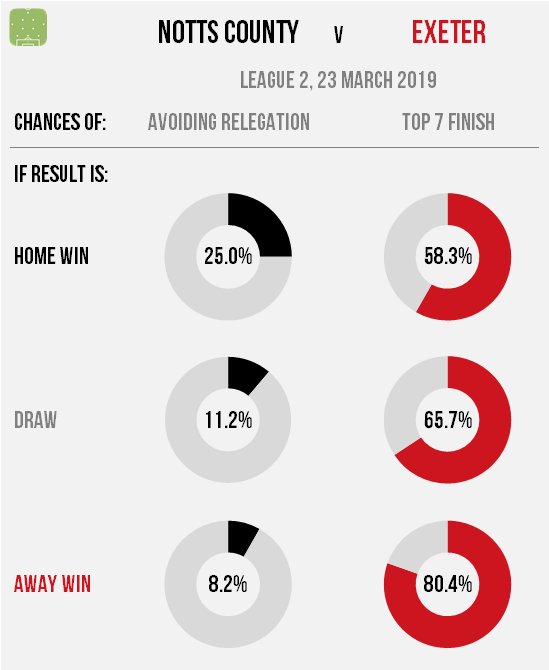 Visitors Exeter have problems of their own, with any points dropped here likely to dent their chances of a play-off finish – Colchester and Carlisle are just a point behind the Grecians. Just about any match between teams in the bottom half of League 1 qualifies as a relegation six-pointer at the moment, although in this case the stakes are much higher for the home side. Rochdale are in serious trouble, with even a win here only raising their survival chances to a shade over one in three. Scunthorpe’s performances have looked worse than their results this season so the model gives the home side a fair chance of winning but, as the Iron have three more fixtures against clubs in the bottom five, defeat wouldn’t doom the visitors. In fact an away win would all but secure safety for Scunthorpe while leaving Dale with a mountain to climb. The Saddlers dropped into the bottom four recently but the table is so congested that they could move as high as 13th with a win this weekend. Shocking high-flying Barnsley would also increase their chances of avoiding the drop to around three in four, and even defeat wouldn’t put their survival prospects far below 50:50. For the visiting Tykes this is an opportunity to keep second place out of Sunderland’s hands: if they slip up then they would probably start next week almost as likely to finish outside the top two as to remain within it. We finish with another somewhat unbalanced relegation six-pointer and again it’s one where the side with less at stake look relatively vulnerable. Gillingham’s performance data has been pretty ropey – albeit improving recently – which gives their in-form hosts a fair chance of taking a big step towards survival. 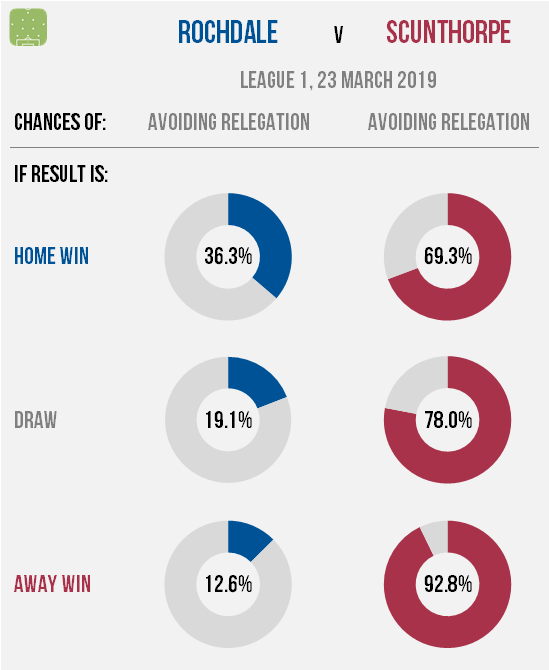 Wimbledon pretty much have to win this one: doing so could leave them needing just a point to exit the relegation zone and bolster their hopes of finishing outside it to nearly 50%. A win for the Gills however would leave their own safety all but secured while leaving their hosts with a worse than one in five chance of remaining in the third tier with them.